On October 16 and 18, 2017, Federal Finance Minister Bill Morneau released new measures designed to counterbalance the proposals that were previously announced on July 18 of this year. This summary contains highlights of these new announcements and modifications to the previous proposals, which are not yet law. Clients should contact their Investors Group Consultant for information on how these proposals may affect their financial plans. Effective January 1, 2018, the small business tax rate that applies to the first $500,000 of active business income will decrease from 10.5% to 10%. A further reduction from 10% to 9% will occur on January 1, 2019, ultimately resulting in a potential maximum tax savings of $7,500. This rate decrease was first discussed as part of the 2015 federal election campaign. Passive investments are used by small and medium-sized businesses to manage personal income risk, sick leave and/or maternity/paternal leave. Additionally, passive investments are used by small business owners as a flexible retirement savings tool since Registered Retirement Savings Plans, etc., cannot provide funds when business volatility strikes. What is being proposed in the October 16 announcements to address the above concerns? The federal government will no longer proceed with measures to restrict access to the LCGE. The federal government has expressed its intention to simplify the proposals pertaining to income sprinkling, and reasonableness tests will still be a key component of the proposals. However, demonstrating contribution to the business will now be based on any combination of the following: labour contributions; capital or equity contributions to the business; accepting financial risks of the business (such as co-signing for debt); and/or past contribution in respect of previous labour, capital or risks. The income sprinkling measures are still intended to apply on January 1, 2018 and beyond. Upcoming revisions to the proposals and draft legislation, anticipated to be released later this fall, will also include measures to address concerns over double taxation. What is being proposed in the October 18 announcements to address the above concerns? Past investments already made within private corporations, including the future income earned from such investments, will be protected from the new measures, which will apply on a go-forward basis. In order to enable businesses to save for contingencies etc., there will be a passive income threshold of $50,000 per year for future, go-forward investments (an equivalent of $1 million in savings based on a nominal 5% rate) on which the old tax rates will apply. No details were provided on the tax rate applicable on income earned above this threshold. Government will work to ensure incentives remain for venture capital and angel investors to continue to invest in Canadian innovation. Draft legislation on the changes relating to passive investments will be released as part of Budget 2018. The Department of Finance indicates that the majority of owners of private corporations are men, and men represent over 70% of higher-income earners initiating income sprinkling strategies. The federal government indicates that it will consider the gender impacts of measures proposed to address tax planning involving private corporations, but has not provided any details to date on how that might be accomplished. Mr. Morneau has indicated that over the next couple of days and weeks, more announcements will be forth coming. He indicated that the informal consultation process continues through ongoing conversations with small business owners, stakeholders, local chambers of commerce, etc. Investors Group will follow these announcements closely and will communicate the impact they may have on your plan. 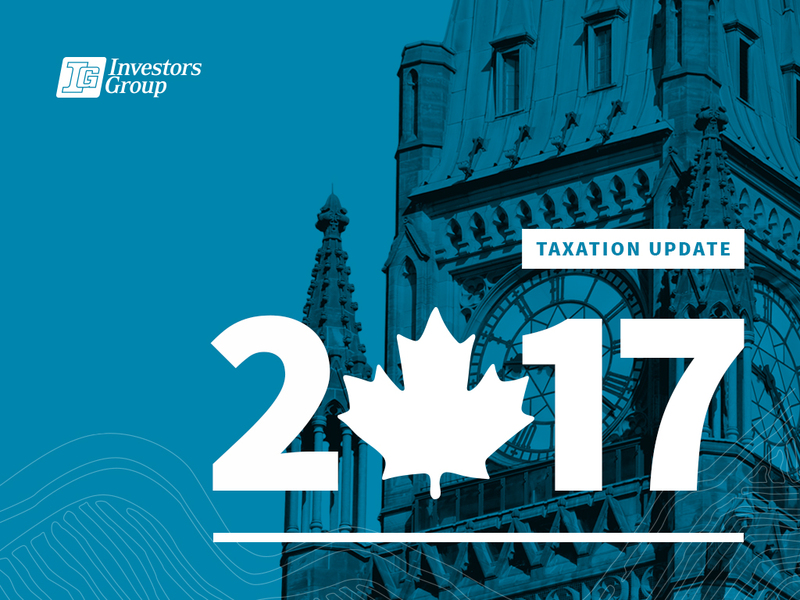 For more information on the July 18, 2017 proposals, read New tax rules and the impact on your incorporated business and refer to our Q & A. Written and published by Investors Group as a general source of information only. Not intended as a solicitation to buy or sell specific investments, or to provide tax, legal or investment advice. To seek advice on your specific circumstances, please feel welcome to email me at norman.piche@igprivatewealth.com .